Interstate 490 provides a direct route to the city of Rochester from Interstate 90 (New York Thruway) east from Buffalo and west from Syracuse. The Thruway bypasses the city to the south, passing through the metropolitan area at both Victor and Henrietta. Heading north from the Thruway in the eastern notch of Genesee County, Interstate 490 travels to the village of Bergen before turning east into Monroe County ahead of Churchville. The rural freeway extends east 11 miles to the town of Chili, where adjacent agricultural areas give way to subdivisions. Curving north, I-490 passes through the town of Gates by Rochester Technology Park and through interchanges with the Airport and Spencerport Expressway freeway spurs. Interstate 490 turns again to follow the Western Expressway from NY 531 to I-390 / NY 390 and west central Rochester. The urban freeway passes through a mixture of industrial and residential areas to the Inner Loop, a former full beltway encircling the central business district. I-490 makes up the southern third of the loop as it crosses the Genesee River on the Frederick Douglass – Susan B. Anthony Memorial Bridge. Southeast from the Genesee River, I-490 leaves the Inner Loop and joins the Eastern Expressway to the Can of Worms Interchange with I-590 and NY 590. The freeway remains urban in design southeast through Brighton and into Pittsford with a barrier median and sound walls. Beyond NY 31F (Fairport Road) and East Rochester, Interstate 490 reduces to four lanes and travels more southerly through the town of Perinton. The final stretch crosses the Ontario County line southward to the New York Thruway in the town of Victor. 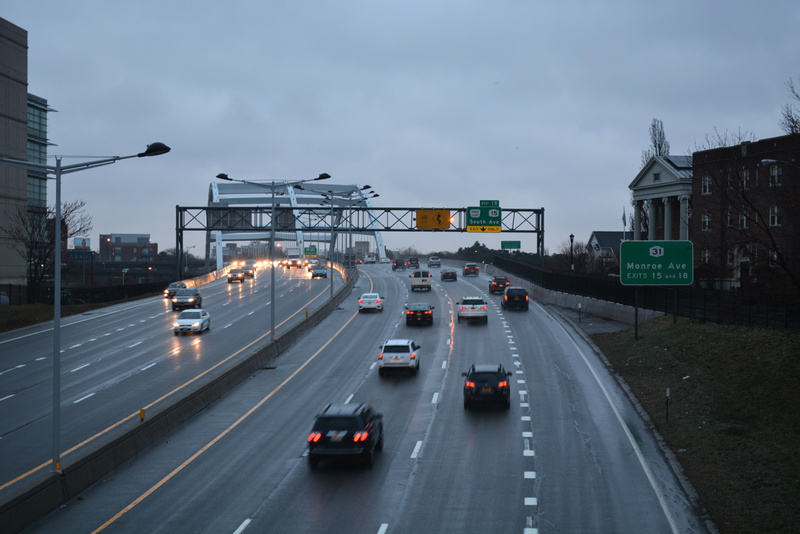 Interstate 490 was originally designed to provide convenient access from the New York Thruway and Rochester suburbs to Downtown. Through the west side of Rochester, the mainline was constructed in three contracts over a more than ten year period. The first segment was finished between the Erie Canal and Mt. 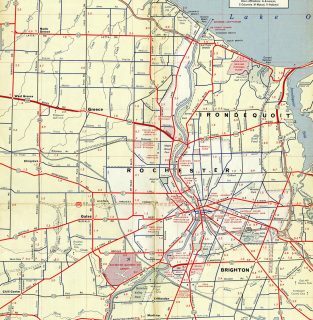 Read Boulevard (Exit 10) in 1963. I-490 was completed from Exit 10 to Platt Street (Exit 12) in 1971. Interstate 490 crosses over both NY 383 (Exchange Street) and the Genesee River over the Frederick Douglass-Susan B. Anthony Memorial Bridge. Photo taken 01/18/17. Interstate 490 west of the Plymouth Avenue overpass at Downtown Rochester. Photo taken 01/18/17. 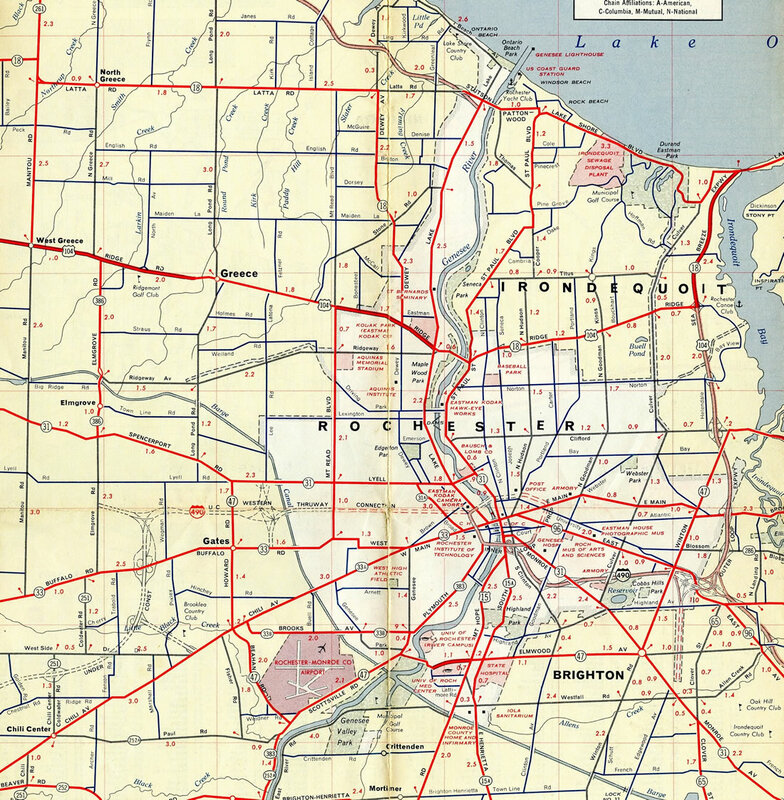 Interstate 490 (Eastern Thruway Connection) was already opened to traffic from the south arc of the Inner Loop in Rochester to New York 96 south of Pittsford by 1961. New York 96 (Pittsford Victor Road) intertwines with Interstate 490 south from the Erie Canal and the town of Perinton to the town of Victor and New York Thruway. Exit 29 departs from I-490 for New York 96 east just ahead of the Thruway toll plaza. Photo taken 05/09/05. Traffic partitions beyond the toll plaza for Interstate 90 west 77 miles to Buffalo and east 69 miles to I-81 at Syracuse and 203 miles to state capital. Photo taken 05/09/05. Passing well south of Rochester, Interstate 90 follows a mostly rural route west from Victor toward Henrietta and east to Manchester. Photo taken 05/09/05. 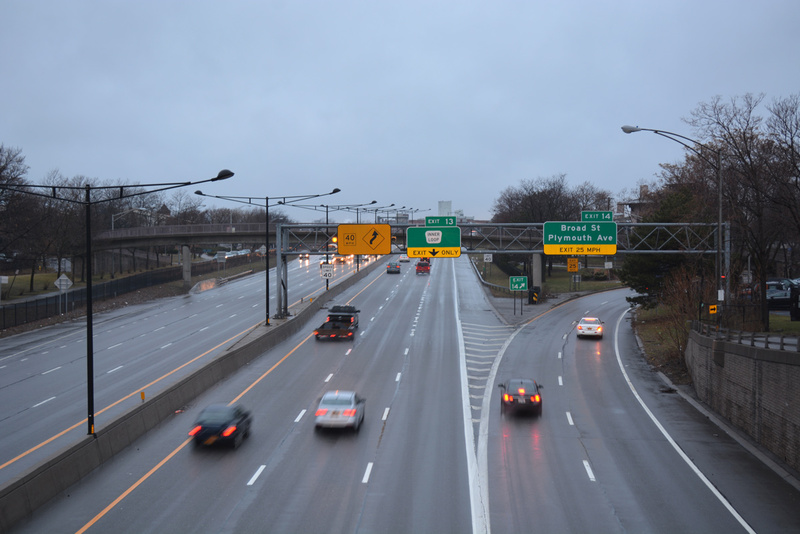 The westbound New York Thruway expands to four lanes with an auxiliary lane accompanying I-90 from the Seneca Service Area to Exit 45 with Interstate 490. Photo taken 01/17/17. Three quarters of a mile ahead of the trumpet interchange (Exit 45) with Interstate 490 on I-90 west. I-490 winds northward along side NY 96 (Pittsford Victor Road) over the first seven miles through suburban areas from Eastview Mall to Pittsfield. Photo taken 01/17/17. Exit 45 separates from the New York Thruway westbound mainline for Interstate 490 through Victor. The urban loop reaches Downtown Rochester in 15 miles. I-90 stays to the south through rural areas, next meeting Interstate 390 at Henrietta in 11.3 miles. Photo taken 01/17/17. Angling southwest into Genesee County near Pinnacle Hill (el. 764 feet), Interstate 490 enters a trumpet interchange (Exit 1) with New York 19 (Lake Street Road) and Vallance Road east. The freeway ends in one quarter mile at the Thruway toll plaza. Photo taken by Jeff Morrison (07/01/07). Viewing the toll plaza at the western terminus of Interstate 490 from Exit 1. A staging area lines the west side of the ending freeway for over length truckers permitted along the Thruway. Photo taken by Scott Steeves (03/29/07). Ramps for Interstate 90 west to Buffalo and Niagara Falls and east to Syracuse and Albany partition beyond the toll plaza. Photo taken by Jeff Morrison (07/01/07). Interstate 90 continues 11.3 miles west to NY 98 at Batavia and 15.8 miles east to Exit 46 for I-390 and NY 253 at Henrietta. Lengthy exit less stretches are common along the Thruway across Upstate New York. Photo taken by Jeff Morrison (07/01/07). Eastbound Interstate 90 at the off-ramp (Exit 47) for I-490 east. Interstate 490 follows a rural course northeast to Churchville, and through the western suburbs of Chili and Gates on the 23-mile drive to Downtown Rochester. Exit 1 of I-490 connects with New York 19, a north-south route traveling 109 miles from the Pennsylvania line at Shongo and Lake Ontario State Parkway at Hamlin. Photo taken by Brian Tabor (04/02). A rural trumpet interchange joins Interstates 90 and 490 just east of the New York 96 (Lake Street Road) overpass. Photo taken by Scott Steeves (03/29/07). Interstate 90 west enters northeastern Genesee County at the Ontario Service Area, and advances west 2.6 miles to meet the west end of Interstate 490 (Exit 47). Photo taken 07/02/05. Interstate 490 stems north from Exit 47 to the town of Bergen. New York 19 runs just west of the freeway. The state route heads south to the nearby town of Le Roy and north 12 miles to the village of Brockport. Photo taken 07/02/05. Traveling north from LeRoy, New York 19 spans the New York Thruway ahead of an access road linking it with Interstate 490. Photo taken by Scott Steeves (03/29/07). Original construction of Interstate 490 included a slight realignment of New York 19 to the east to tie into the adjacent trumpet interchange. Vallance Road was also realigned to connect with the east side ramps. Photo taken by Scott Steeves (03/29/07). The westbound on-ramp to I-490 for the New York Thruway ties into New York 19 directly. The state route otherwise resumes a northward heading to Stone Church and Bergen. Photo taken by Scott Steeves (03/29/07). Creation of I-490. http://www.dot.state.ny.us:80/reg/r4/490gateway/schedule.html Reconstruction of 490 – Erie Canal to the Genesee River – The Western Gateway to Rochester, NYSDOT project web site. “NYSDOT Announces Completion of Troup Howell Bridge – New Triple Steel Arches Become Rochester Landmark.” NYSDOT news release. June 15, 2007. .us:80/reg/r4/490gateway/schedule.html Reconstruction of 490 – Schedule. http://www.dot.state.ny.us:80/reg/r4/490gateway/schedule.html Reconstruction of 490 – Schedule, NYSDOT project web site. Frederick Douglass Susan B. Anthony Memorial Bridge. City of Rochester, NY web site. “Frederick Douglass-Susan B. Anthony Memorial Bridge Shines in Bridge Construction Competitions.” NYSDOT news release. October 5, 2007. Page updated on July 24, 2017.